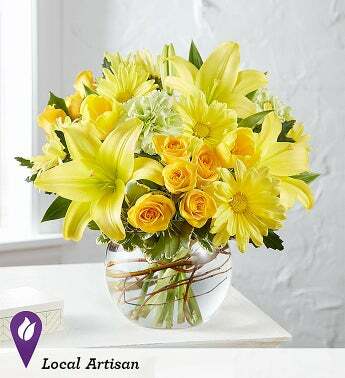 LOCAL ARTISAN Spring is looking brighter than ever! Our vibrant new bouquet is gathered with cheerful yellow blooms and unique curly willow tips inside a charming, petite bubble bowl. Created by Breanna Cartwright of Modesto, California, it’s the kind of surprise that inspires lots of sunny days ahead.